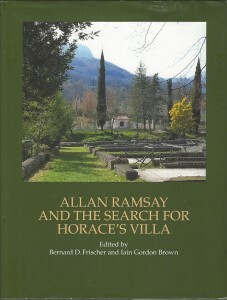 Allan Ramsay and the Search for Horace's Villa, edited by Bernard D. Frischer and Iain Gordon Brown with contributions by Bernard Frischer, Iain Gordon Brown, Patricia R. Andrew, John Dixon Hunt and Martin Goalen (Ashgate, London, 2001). ISBN 0754600041. Published with the assistance of the Getty Grant Program. For an online review of this book, see: http://bmcr.brynmawr.edu/2002/2002-07-07.html.